You may not have anything to hide when we surf the Internet, but you still may want to clear your history every now and then. 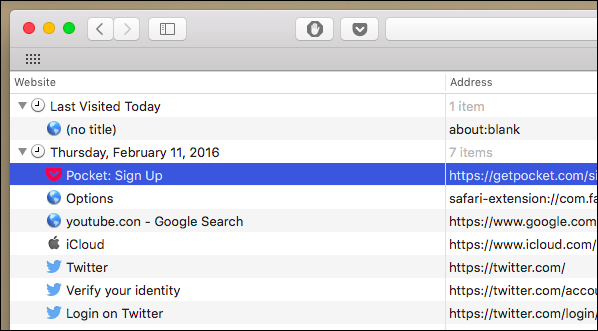 It’s pretty easy on Safari for OS X and only takes a couple clicks. Clearing your browsing history doesn’t have to be an intricate chore. 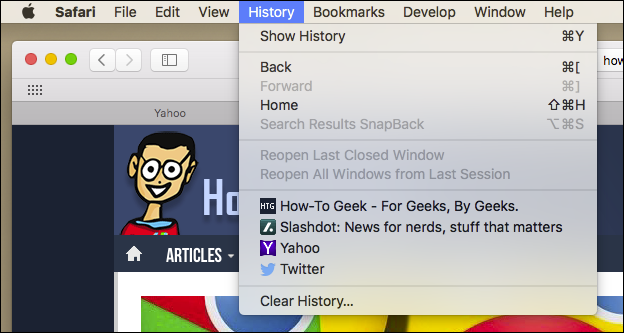 On Safari, all you do is click the “History” menu and select “Clear History…” at the bottom. Once you do this, you will be given a choice, you can delete “the last hour”, “today”, “today and yesterday”, and “all history”. When you’ve decided, you can click the “Clear History” button and the history will be clear per your preference. 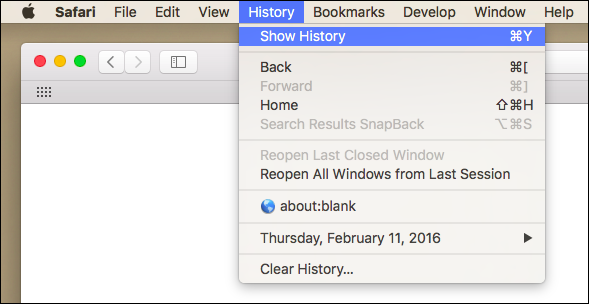 If you simply want to clear part of your history, you can click “Show History” (“Command + Y”). Click on the site or use the “Command” key to select several sites, then press the “Delete” key. 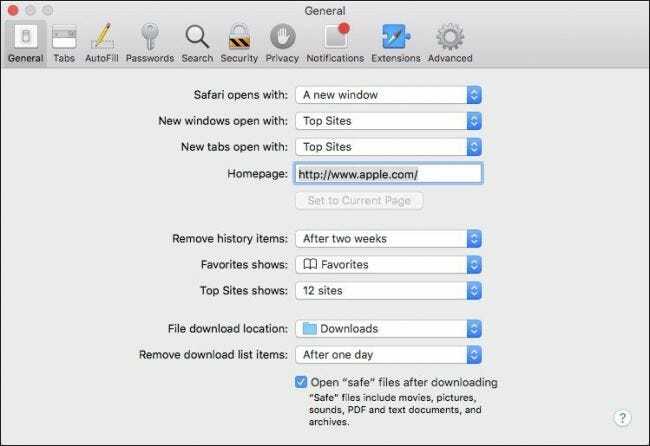 You can also set Safari to automatically clear your history every so often. When you open up the Safari preference (“Command + ,”), click the “General” tab, and select the “Remove History items” option. You can decide when or if your history is automatically deleted after one day, one week, two weeks, one month, one year, or you can keep your history indefinitely by selecting the manual option. 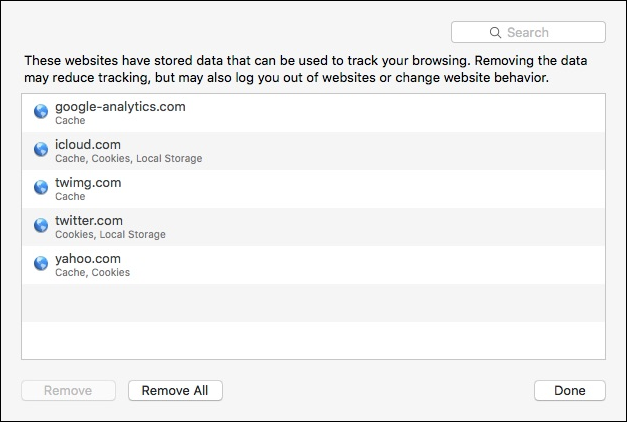 While you’re in the Safari preferences, click on the “Privacy” tab. We’ve talked about how to block third-party cookies, but we didn’t talk about clearing cookies altogether. Simply, click “Remove All Website Data…”. You will be asked to confirm you want to “remove all data stored by websites on your computer”. If you don’t want delete all your cookies, you can click the “Details…” button. On this page, you will see all the cookies stored on your computer. If you select one, you can delete only that single cookie, or you can hold the “Command” button and select several, or you can “Remove All” of them. Keep in mind if you do this, any websites you might have personalized will be removed, and you will be logged out of all websites (though it should be easy to log back in if you’ve saved your username and password). Clearing your history and cookies isn’t necessarily sneaky. It’s good to be privacy-conscious because there are often times when someone will ask to use your computer for a minute. You may not be looking at anything untoward or scandalous, but then again, you don’t necessarily want just anyone knowing what you’ve been looking at or reading.